Cheese and mushrooms. The only way I could have made these roasted portobello mushrooms any better is by adding bacon. Next time! I realize I have a thing for stuffed portobello mushrooms and there’s no shortage of recipes on my blog – from southwestern (vegetarian) to ragu-stuffed. Serve one per person as an appetizer or double up for a healthy entree. 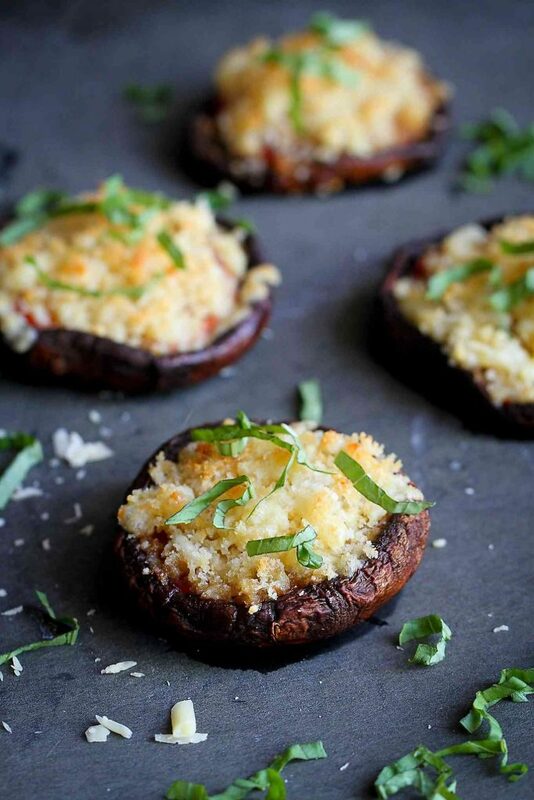 So, what’s the trick to making any kind of stuffed portobello mushrooms? Start by cleaning the mushrooms.Carefully break off the stem. Discard or save for vegetable stock. Using a small spoon, scrape out and discard the gills. Brush the mushrooms with olive oil , and season inside the caps with salt and pepper. You could also add dried or fresh herbs, if you like. Place the mushrooms, in a baking dish or on a baking sheet and roast until becoming tender. Important! Before stuffing the mushrooms, pour any liquid out of the mushrooms. Add the stuffing, then roast until the mushrooms are tender and the filling is warmed. Vegetarian: Fill with beans and/or vegetables, adding flavor with fresh or dried herbs. Top with cheese. Meat lovers pizza: Cook up some Italian sausage and mix with black olives and tomato sauce, and top with shredded mozzarella cheese. Chili lime shrimp: Season shrimp with southwestern spices and sear in a skillet. Put the shrimp in the mushrooms, squeeze with lime and top with queso fresco. 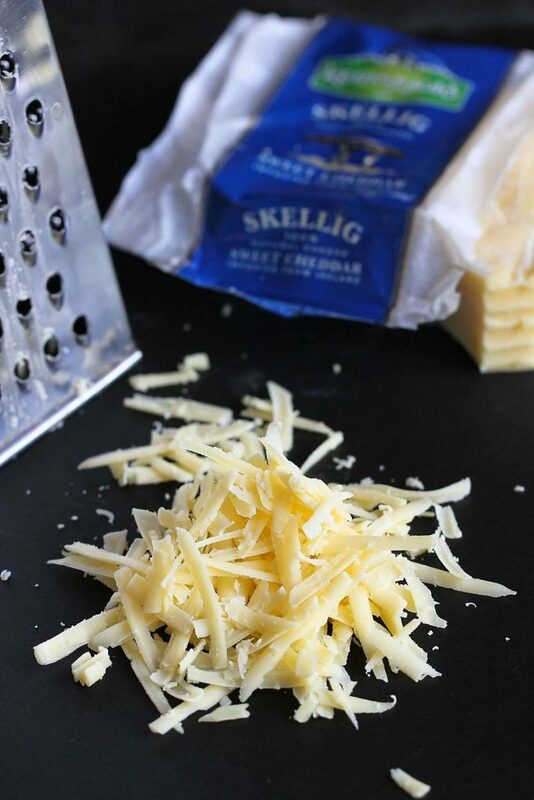 I used Kerrygold’s Skellig sweet cheddar cheese in this recipe, but their popular Dubliner cheese would work just as well. Preheat the oven to 425 degrees F. Lightly coat a baking sheet with cooking spray. Place the portobello mushrooms in the baking dish. Whisk together the balsamic vinegar and 1 tablespoons olive oil, and rub the mixture on the mushrooms. 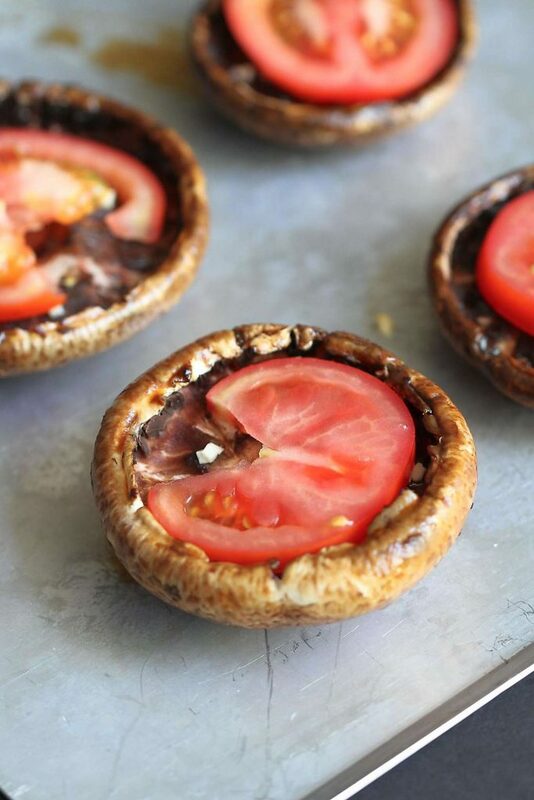 Sprinkle the garlic over the mushrooms, lay one tomato slice on each mushroom, and roast for 10 minutes. Carefully drain any liquid out of the mushrooms. In a small bowl, stir together the cheese, breadcrumbs, 2 teaspoons olive oil and salt. Sprinkle the cheese mixture evenly over the mushrooms. Bake for another 5 minutes, or until the breadcrumbs are light golden brown. Garnish with basil. Serve. This recipe was originally posted on May 2, 2014, and has been updated. Disclosure: This post was sponsored by Kerrygold. All opinions are my own. I am a participant in the Amazon Services LLC Associates Program, an affiliate advertising program designed to provide a means for me to earn fees by linking to Amazon.com and affiliated sites. Nom nom nom! This looks so yummy!! This does look delicious. I would make this for me when the hubby isn’t home. I love mushrooms. Hi Dara, oh these look wonderful, it’s a shame you kids don’t care for mushrooms, but hey that’s more for you, love your stuffing! Happy week-end to you! I was reminded how much I liked mushrooms just yesterday when I had them in a salad (with Greek goat’s cheese and basil – amazing!) These sound like a fantastic healthy appetizer. I bet the crunchy cheesy topping really makes them shine. Oh MY! 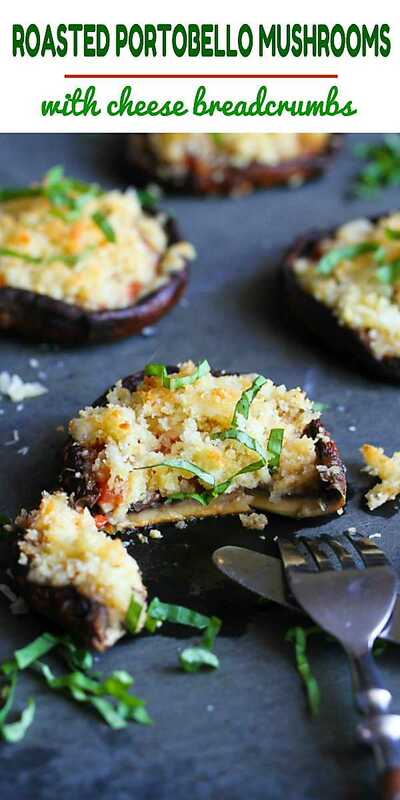 That breadcrumb topping takes these amazing little mushrooms over the top! I am absolutely craving these now! Yum! 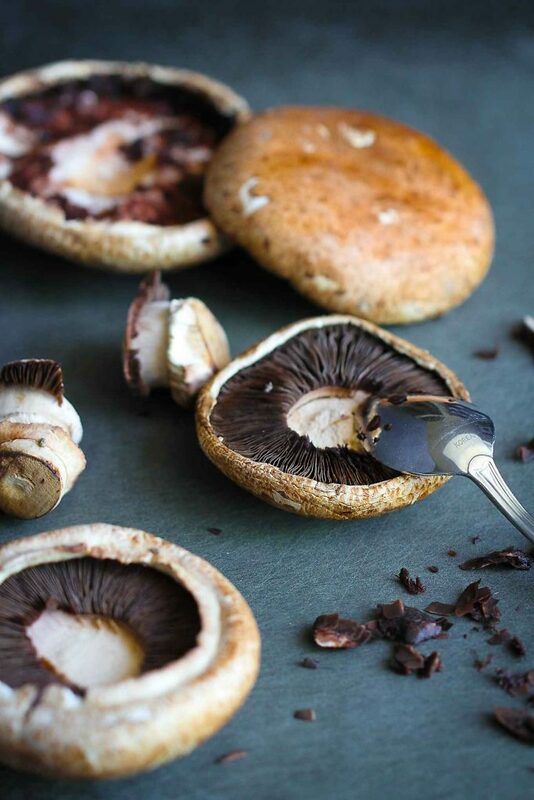 Ooh I am crazy about portobello mushrooms! I can’t wait to try these – they look amazing! 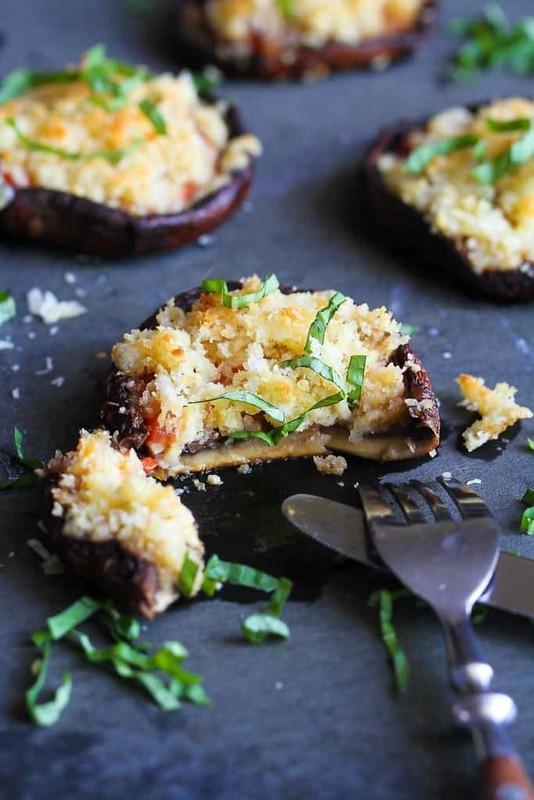 Love any kind of mushrooms but especially stuffed mushrooms! Oh my I’m in heaven! I LOVE portobellos! These are yummy. I am making them for a second time. Do you add the garlic and tomatoes and THEN drain? Or do you roast them a bit, drain And the add the garlic and tomatoes? Is the basil just a garnish after roasting? Hi Charlotte, I’m so glad you enjoyed them! The liquid should be drained out of the mushrooms after the first (10 minute) baking time. Hold the tomato in with one hand and carefully tip the mushroom to drain out the liquid. The basil is for garnishing at the end.